I love zucchini. I’m not sure why, but it could have something to do with the fact that they’re cheap, easy to cook, taste good grilled and represent summer. Oh, and who can forget the fact that they start with Z–I like the letter Z. Usually we just slice them into long strips and toss them on the grill with whatever protein we happen to be grilling, but I was in the mood for something new. We had a few zucchini in crisper and one was definitely getting a little gnarled. I used to be a zucchini bread making machine, but the problem is, I don’t eat zucchini bread. I’ve also been thinking about incorporating more vegetarian meals into our regular sequence for both health and financial reasons. 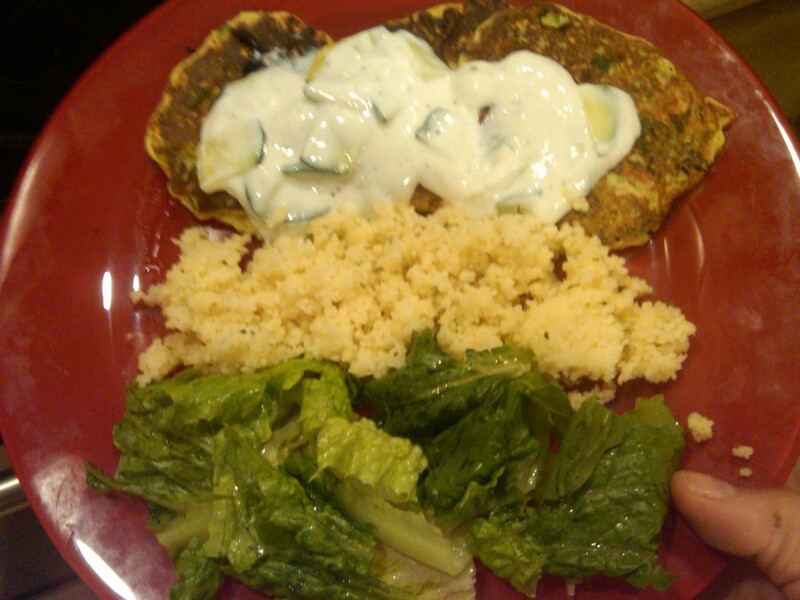 I decided to make zucchini pancakes, which I made a few weeks ago and absolutely loved. I loosely followed Ina Garten’s recipe, but as you know, I strayed from the directions, as per usual. Preheat the oven to 300 degrees F. Only do this step if you intend to keep the pancakes warm in the oven. 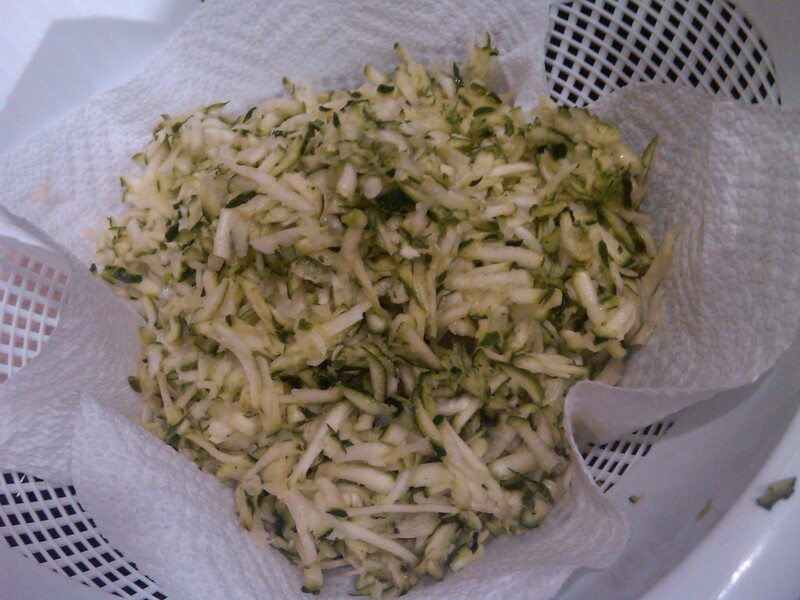 Grate the zucchini into a bowl using the large grating side of a box grater. 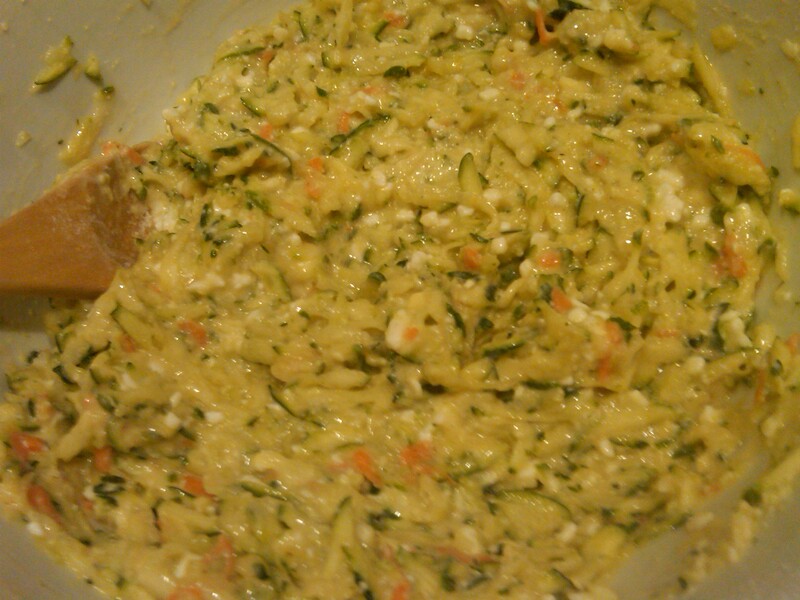 I drained the zucchini for a bit as it seemed extra watery. Immediately stir in the onion and eggs. Stir in 6 tablespoons of the flour, the baking powder, salt, and pepper. 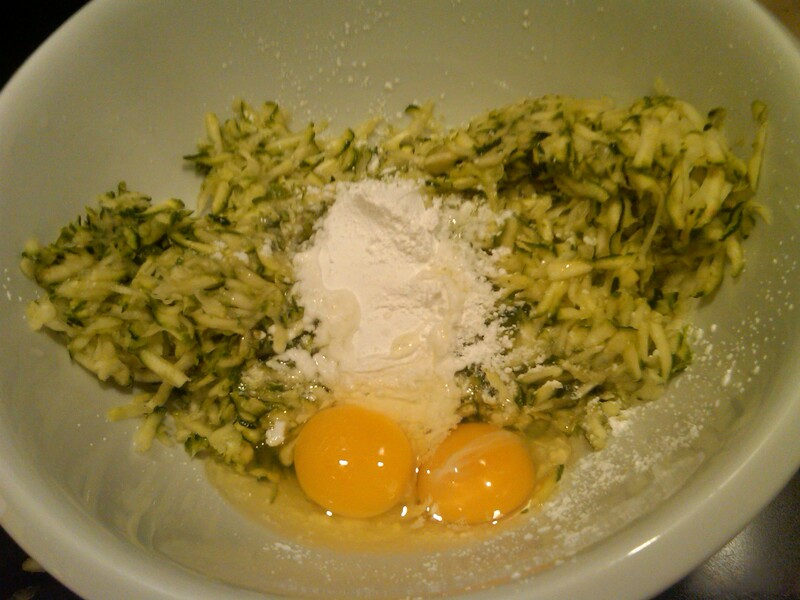 (If the batter gets too thin from the liquid in the zucchini, add the remaining 2 tablespoons of flour.) Somehow I missed Ina’s direction that the eggs were supposed to be lightly beaten (and by missed I mean I read the recipe too quickly and didn’t notice.) I broke the eggs right into the mix (bad girl, you’re supposed to break them into another bowl in case you have a bad egg, no pun intended.) 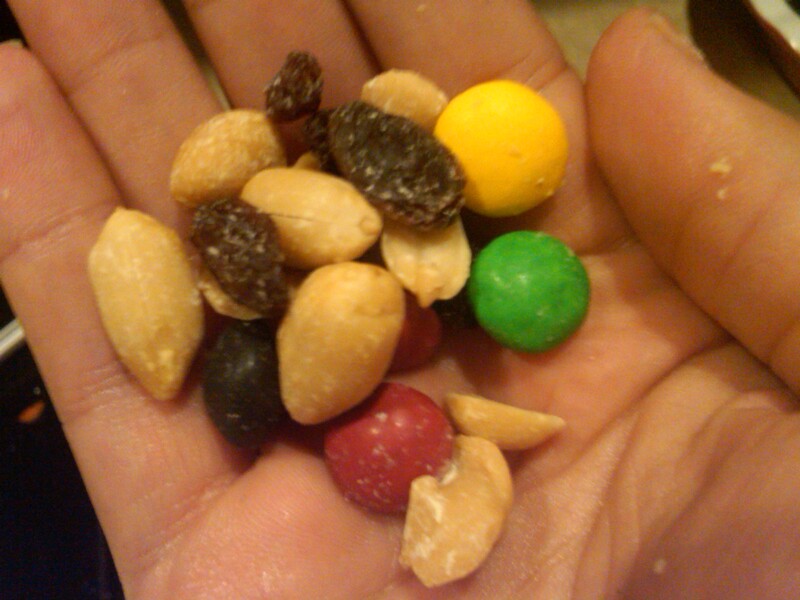 Anyway, I tossed everything into the mixture. 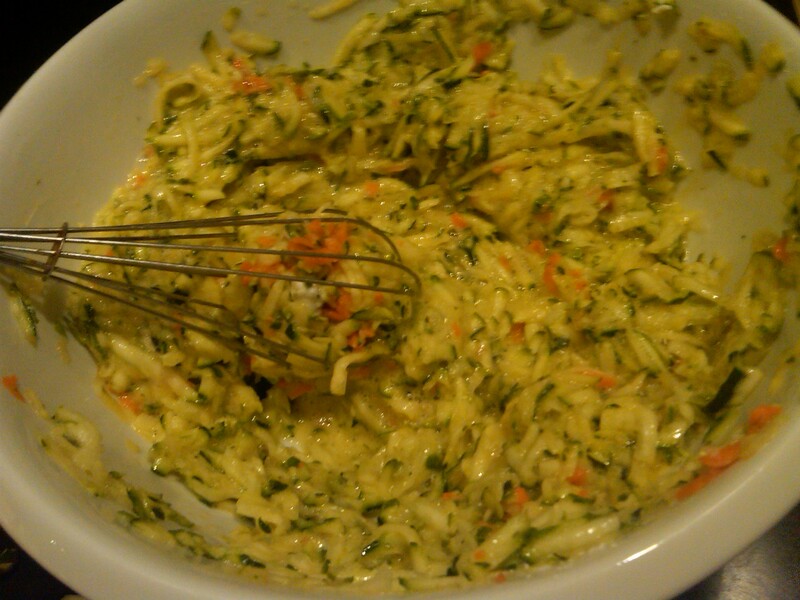 I mixed it up and added some grated carrots as I am wont to do. Doesn’t it look pretty? Because I was feeling a little daring (and I like cheese) I decided to add about 1/4 cup of parmesan cheese rounded out by 1/4 cup of light cottage cheese. I’ve been adding cottage cheese to a lot of things lately and it’s seemed to work, so why the hell not? At this point, I’m eyeballing the batter and adding a little more flour, as needed, if it seems dry. Because I had started this project when I got back from the gym at 8pm I was getting a little hungry. Good thing I had my gorp to keep me company. I learned that word on my 6th grade camping trip and it kind of makes me giggle. 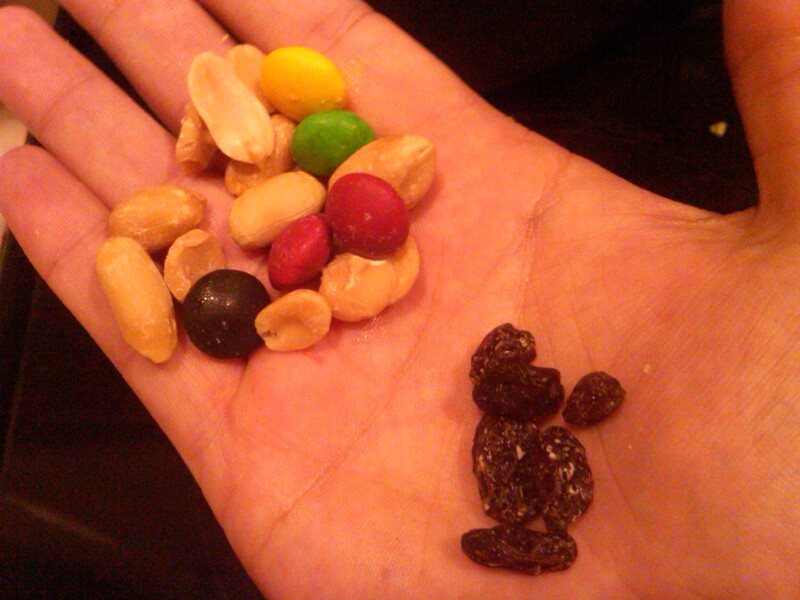 In googling, one source says that gorp stands for “Good Old Raisins and Peanuts.” Well, I don’t like raisins. OK–that’s what Ina wants you to do. I made the following adjustments. 1) I didn’t use a mix of oil and butter. I used just oil. I also used a non-stick pan. Last time I used a regular pan and I think they came out a bit better; you just have to keep an eye on things. 2) As previously stated, I didn’t use the oven to keep the pancakes warm. I loaded them on a plate between layers of paper towel. Here are the pancakes frying. This was my first batch. They got prettier later. One note: be sure you don’t heap the batter on too thick. It will be hard to cook them all the way through. Once I got the frying situation under control, I moved towards the sauce. 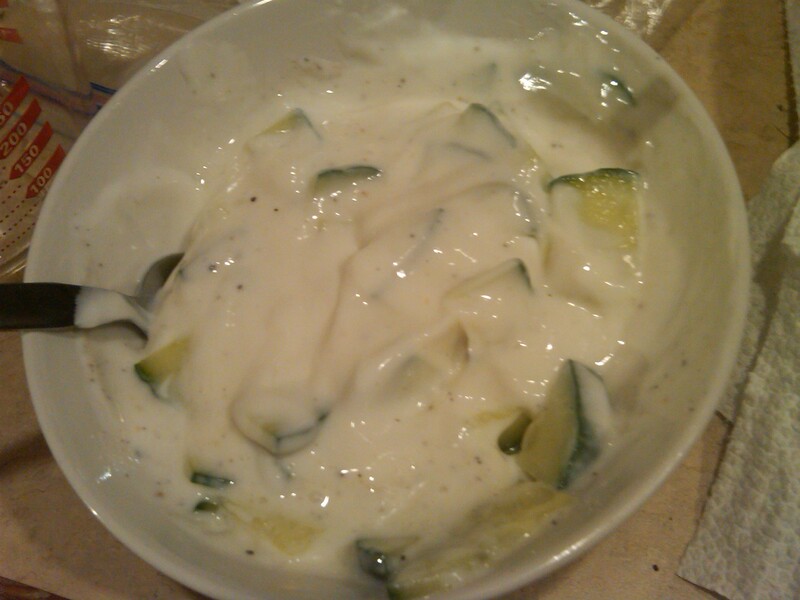 I enjoy the yogurty, cucumber tzatziki, which is often found in Greek and Middle Eastern cuisine and decided to make my version of the sauce. 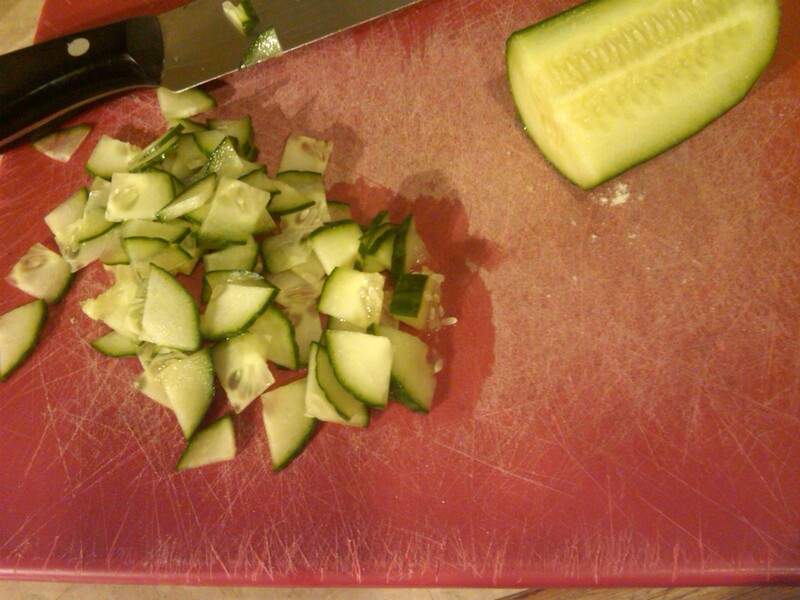 I began by slicing an English cucumber into paper thin slices. I would have used my mandoline but I really didn’t feel like washing another dish. I love English cucumbers. Yes, they’re more expensive than your run of the mill garden cuke, but I feel as if they taste so much better AND they’re unwaxed and do not need to be peeled. Saving a step gets major points with me. 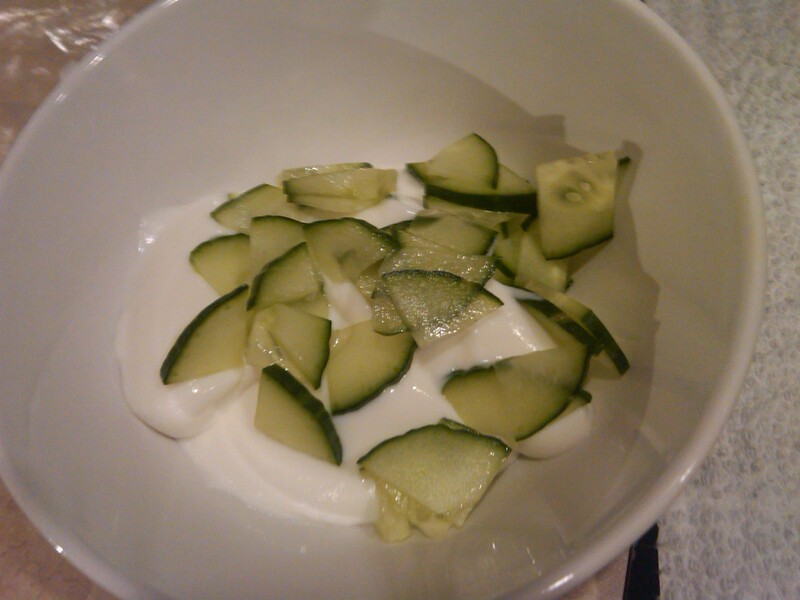 I tossed the sliced cucumber into a cup of fat free sour cream. Then I added the juice from one lemon and salt and pepper. Ta-da! Tzatziki a la Row Home Eats! We rounded out the meal with parmesan cous cous and a simple salad of chopped romaine and sat down to a romantic evening of Top Chef. My husband wasn’t very happy that I commandeered his plate for a photo op before he had the chance to dig in. I told him that we must make sacrifices for the blog. I think he understand. That picture is making me hungry. I think I’ll have some leftovers now. I love leftovers. 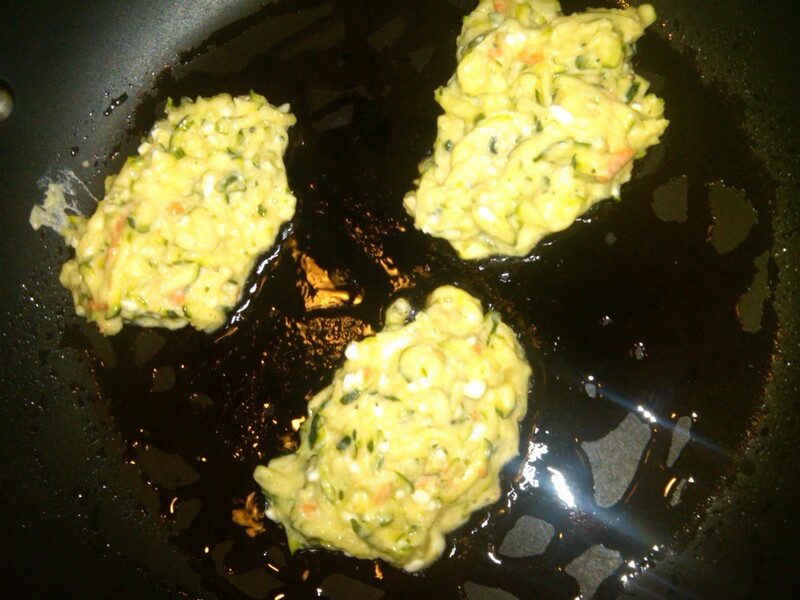 Loving the zucchini cakes- I’m going to try it if I get more in the farm share soon!